(AP) NEW YORK - Occupy Wall Street began to disintegrate in rapid fashion last winter, when the weekly meetings in New York City devolved into a spectacle of fistfights and vicious arguments. Punches were thrown and objects were hurled at moderators' heads. Protesters accused each other of being patriarchal and racist and domineering. Nobody could agree on anything and nobody was in charge. The moderators went on strike and refused to show up, followed in quick succession by the people who kept the meeting minutes. And then the meetings stopped altogether. In the city where the movement was born, Occupy was falling apart. "We weren't talking about real things at that point," says Pete Dutro, a tattoo artist who used to manage Occupy's finances but became disillusioned by the infighting and walked away months ago. "We were talking about each other." 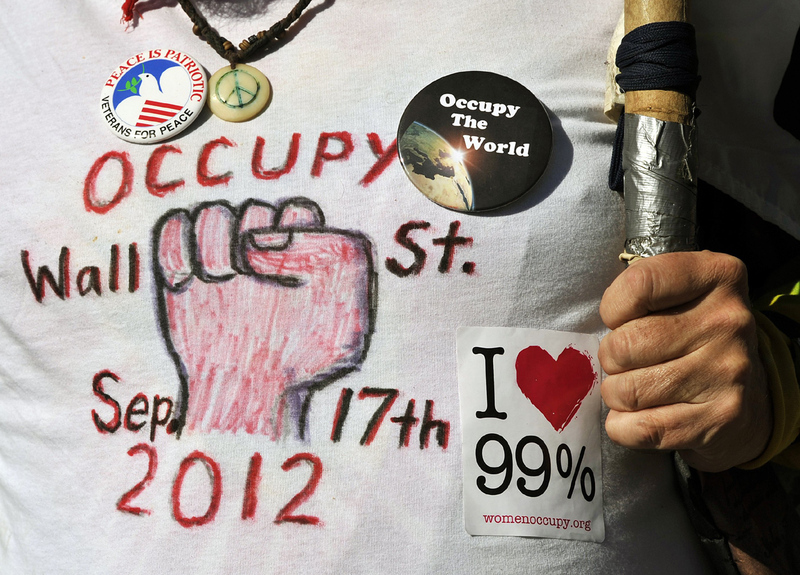 The trouble with Occupy Wall Street, a year after it bloomed in a granite park in lower Manhattan and spread across the globe, is that nobody really knows what it is anymore. To say whether Occupy was a success or a failure depends upon how you define it. Occupy is a network. Occupy is a metaphor. Occupy is still alive. Occupy is dead. Occupy is the spirit of revolution, a lost cause, a dream deferred. "I would say that Occupy today is a brand that represents movements for social and economic justice," says Jason Amadi, a 28-year-old protester who now lives in Philadelphia. "And that many people are using this brand for the quest of bettering this world." On Monday, protesters will converge near the New York Stock Exchange to celebrate Occupy's anniversary, marking the day they began camping out in Zuccotti Park in lower Manhattan's financial district. Marches and rallies in more than 30 cities around the world will commemorate the day. About 300 people observing the anniversary marched Saturday, and at least a dozen were arrested, mostly on charges of disorderly conduct, police said. But the movement is now a shadow of its mighty infancy, when a group of young people harnessed the power of a disillusioned nation and took to the streets chanting about corporate greed and inequality. Back then it was a rallying cry, a force to be reckoned with. But as the encampments were broken up and protesters lost a gathering place, Occupy in turn lost its ability to organize. The movement had grown too large too quickly. Without leaders or specific demands, what started as a protest against income inequality turned into an amorphous protest against everything wrong with the world. "We were there to occupy Wall Street," Dutro says. "Not to talk about every social ill that we have." The community that took shape in Zuccotti Park still exists, albeit in a far less cohesive form. Occupiers mostly keep in touch online through a smattering of websites and social networks. There are occasional conference calls and Occupy-affiliated newsletters. Meetings are generally only convened to organize around specific events, like the much-hyped May Day event that ultimately fizzled last spring. The movement's remaining $85,000 in assets were frozen, though fundraising continues. "The meetings kind of collapsed under their own weight," explains Marisa Holmes, a 26-year-old protester among the core organizers who helped Occupy rise up last fall. "They became overly concerned with financial decisions. They became bureaucratic." In other words, they became a combustible microcosm of the society that Occupiers had decided to abandon - a new, equally flawed society with its own set of miniature hierarchies and toxic relationships. Even before the ouster at Zuccotti Park, the movement had been plagued with noise and sanitary problems, an inability to make decisions and a widening rift between the park's full-time residents and the movement's power players, most of whom no longer lived in the park. "We've always said that we want a new society," Holmes says. "We're not asking anything of Wall Street. We don't expect anything in return." Occupy organizers in other U.S. cities have also scattered to the winds in recent months. In Oakland, a metal fence surrounds the City Hall lawn that was the hub of protesters' infamous tear-gassed, riotous clashes with police. The encampment is gone, as are the thousands who ventured west to help repeatedly shut down one of the nation's largest ports. "I don't think Occupy itself has an enormous future," says Dr. Mark Naison, a professor at Fordham University in New York City. "I think that movements energized by Occupy have an enormous future." Across the nation, there have been protests organized in the name of ending foreclosures, racial inequality, police harassment of minority youth, student debt: You name it, Occupy has claimed it. Occupy the Bronx. Occupy the Department of Education. Occupy the Hood. Occupy the Hamptons. Protesters opposing everything from liquor sales in Whiteclay, Nebraska, to illegal immigration in Birmingham, Alabama, have used Occupy as a weapon to fight for their own causes. In Russia, opposition activists protesting President Vladimir Putin's re-election to a third term have held a series of Occupy-style protests. Young "indignados" in Spain are joining unions and public servants to rally against higher taxes and cuts to public education and health care. "All around the world, that youthful spirit of revolt is alive and well," says Kalle Lasn, co-founder of Adbusters, the Canadian magazine that helped ignite the movement. In New York, groups of friends who call themselves "affinity groups" still gather at each other's apartments for dinner to talk about the future of Occupy. A few weeks ago, about 50 Occupiers gathered in a basement near Union Square to plan the anniversary. There were the usual flare-ups, with people speaking out of order and heckling the moderators. The group could not agree on whether to allow a journalist to take photographs. An older man hijacked the meeting for nearly 15 minutes with a long-winded rant about the New York Police Department's stop-and-frisk tactics. A document called "The Community Agreement of Occupy Wall Street" was distributed that, among other outdated encampment-era rules, exhorted Occupiers not to touch each other's personal belongings and laid out rules about sleeping arrangements. It is this sort of inward-facing thinking - the focus on Occupiers, not the world they're trying to remake - that saddens ex-protesters like Dutro, who wanted to stay focused on taking down Wall Street. Hanging in the entryway to his Brooklyn apartment, like a relic of the past, is the first poster he ever brought down to Zuccotti Park. In black and gold lettering, painted on a piece of cardboard, the sign says: "Nobody got rich on their own. Wall St. thinks U-R-A-SUCKER." He keeps it there as a reminder of what Occupy is really fighting for. Because despite his many frustrations, Dutro hasn't been able to stamp the Occupy anger out of his soul. Not yet. On Sept. 17, he'll be down at Liberty Square again. And he'll be waiting, like the rest of the world, to see what happens next. "We came into the park and had this really magical experience," he says. "It was a big conversation. It was where we all got to realize: 'I'm not alone.'"